STYLISH CELEBRATION: Trelawny Howell, great-grandniece of Casa Loma builder Sir Henry Pellatt, used the occasion to celebrate her birthday in style. 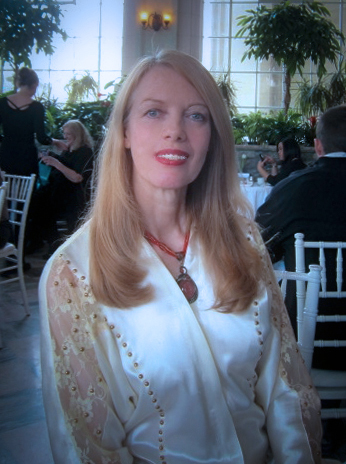 Trelawny Howell celebrated her birthday in high style on Feb. 8, celebrating High Tea with 100-plus guests at Casa Loma. Like the French maids and butlers serving tea and hors d’oeuvres in the dining room and conservatory, the great-grandniece of Casa Loma builder Henry Pellatt dressed for the occasion, wearing a vintage white satin dress with lace sleeves, accessorized by an egg-size red brooch. Dessert was served from a three-and-a-half metre tea cake stand in the great hall, and guests were treated to organ music as they mingled. It was all part of the annual citywide Winterlicious food celebration, and the first such event to be organized at the Toronto landmark by new operators Liberty Entertainment Group, which took over operations in January. Liberty is the company Howell had recommended to city hall as an alternative operator to the Kiwanis Club, which had run Casa Loma operations for 74 years. The city ended its relationship with the Kiwanis Club and assumed control in 2011. It appointed a board to plan the castle’s next direction. The board chose Liberty as the castle’s new operators in October. “It’s a fantastic punctuation of, ‘There’s something grand happening here!’” new president Catherine Bridgman exclaimed about the event that was so well received extra sittings and extra dates had to be added. A cornerstone of Liberty’s agreement with the city is the $7.4 million it pledged to restore the castle. The company has already installed a new bannister on the main staircase in the great hall, four vintage automobiles in the carriage room at the stables, and silver chandeliers in the dining room and library. “We are going to respect the heritage and finish it where it needs to be finished,” company president Nick Di Donato said at the event. One plan is to convert the unfinished swimming pool into a 60-person screening room that could be used for private screenings or during the Toronto International Film Festival. “What we’d like to do, more than anything else, is make this the people’s castle again,” Di Donato said.